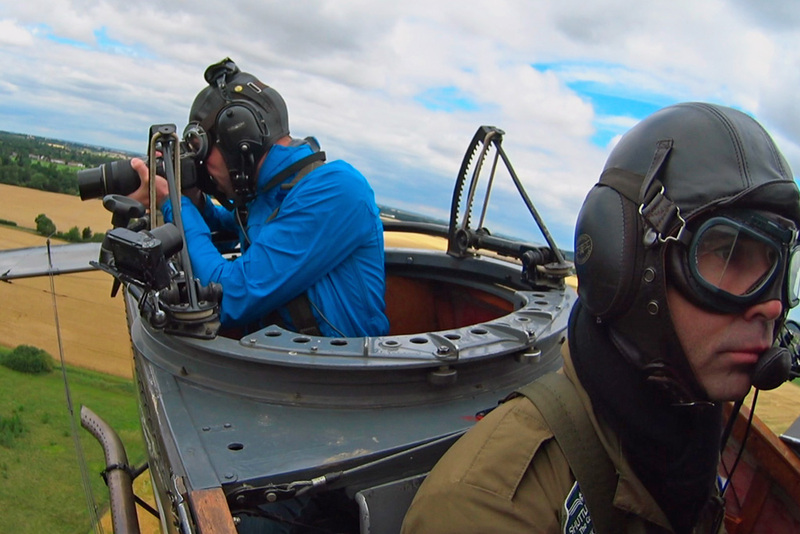 Come fly with us as we look at Scotland from the Sky, taking the perspective of a WWI aerial reconnaissance pilot. It was an all-out assault on the senses. The growling power of the V12 Rolls-Royce engine rumbled through the metal seat, vibrating my body like a tuning fork. But that was nothing compared to the incessant fury of the air rushing towards me at 100-miles-an-hour. With no windshield to protect me, it landed blow after blow, knocking my head this way and that. Every time I raised my long-lens camera to take a picture, the air caught it and threw me back against the sharp rim of the rear cockpit. I had no option but to loosen the shoulder straps of my seatbelt and use the extra range of movement to brace my arms against the triangular metal strut behind me – a strut that had once mounted a machine gun. I tried to bring my eye to the camera’s viewfinder, but all I could see was a green and brown blur racing past some 500 feet below. James Crawford struggling to take photographs from the rear cockpit of the Bristol Fighter. My ‘mission’ was to photograph four flags hidden somewhere in the airfield’s expansive grounds. 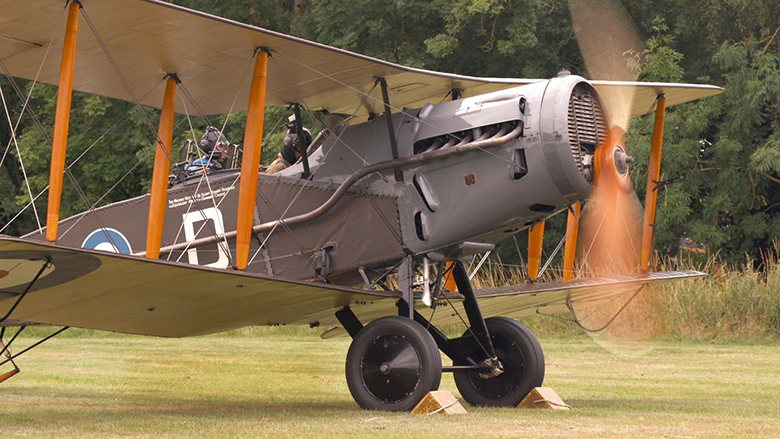 And I was trying to do it from a First World War Bristol F2B Fighter. An aircraft that was exactly 100 years old – the only original of its kind that can still fly today. The point of all this was to get a sense – albeit a crude one – of what it must have been like for the young men who, a century before, first combined flight and photography. While cameras had previously been taken into the skies in (often tethered) hot air balloons, it was the invention of powered aircraft that really revolutionised aerial photography. The timing, however, could not have been worse. This fledgling discipline would grow up in the most desperate of circumstances. In the killing fields of the Great War. Millions faced off across a few hundred yards of no man’s land. ‘The unheroic dead who fed the guns’ the war poet Siegfried Sassoon called them. Casualties were catastrophic and success was measured in inches. Everything was focused on finding weak spots in trench lines running from the English Channel to Switzerland. And what better way than from the air? The intelligence war had a new weapon. Look up from those trenches and you might find you were being watched. But, for those doing the watching, it was a very precarious business. Aerial reconnaissance needed two men – a pilot and an observer. The observer started off as navigator, spotter, radio operator, machine gunner and even sketcher. But soon he was simply the photographer. He sat in the back, in open, un-armoured fuselage. Exactly where I was sitting, in exactly the same aircraft. That, of course, was where the similarities ended. I was using a modern, compact DSLR camera with an automatic zoom lens. The observer used a heavy glass plate camera that was bigger than a briefcase – often developing the negatives while still in the air. Another small matter was that no one was shooting at me. Had I been sitting in that same Bristol a hundred years earlier, the chances are that I would have been dead within the week. Being an observer was one of the most dangerous roles in the war. 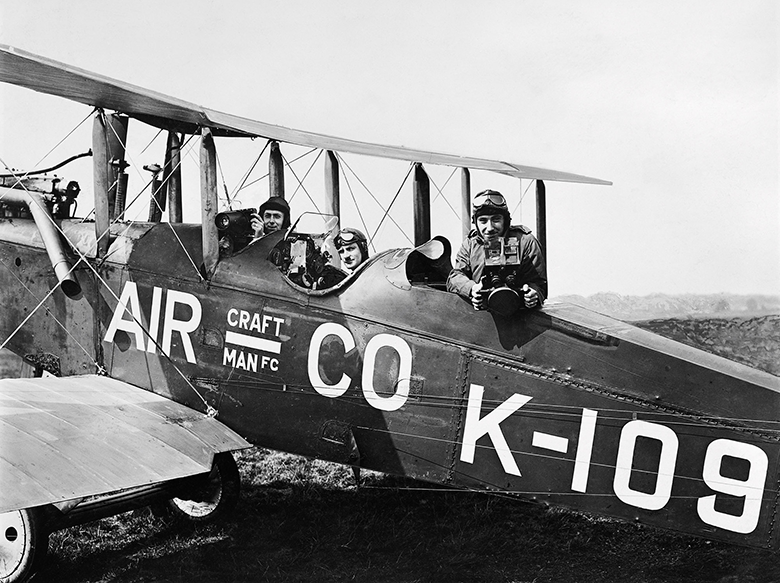 By the spring of 1917, only one out of every three reconnaissance pilots was still flying. But every single observer had been killed or injured. By this time a photographic map of the entire Western Front had been put together and was updated daily. From the skies, the trenches looked like an endless row of teeth, or a child’s drawing of castle battlements – surrounded by the black dots of shell holes. Two and a half million photographs were taken in 1918 alone, contributing to a staggering total of ten million produced over the course of the whole conflict. 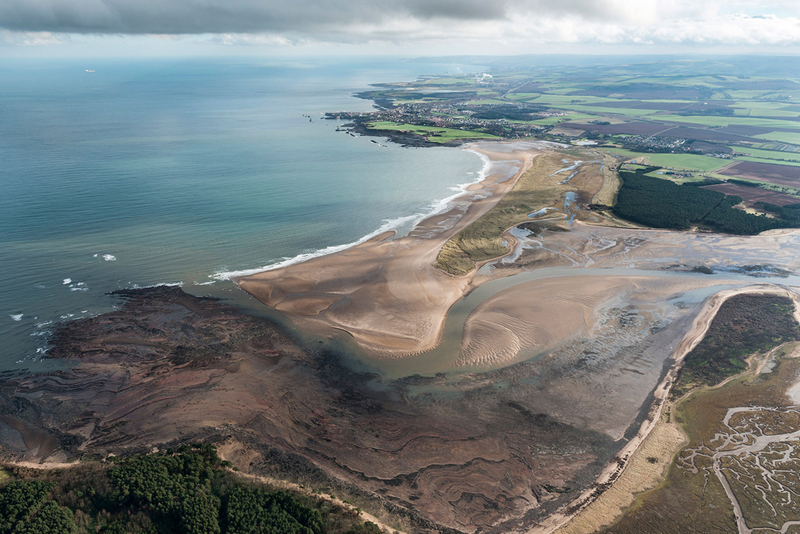 Aerial view of Belhaven Bay today. 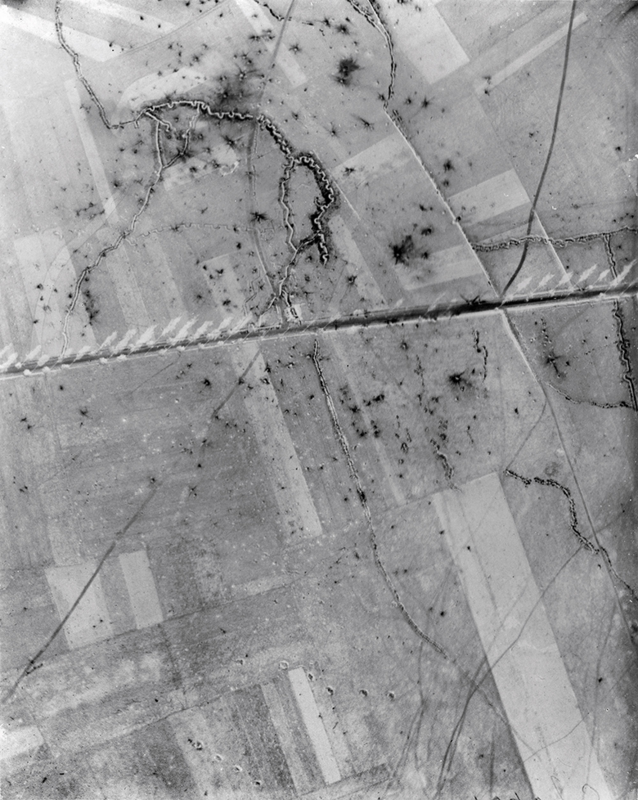 WWI trenches can still be seen from above, and this is thought to be the site of the earliest aerial photo of Scotland taken in 1917. The sacrifices made by these reconnaissance crews have been largely forgotten. Instead it was the exploits of the fighter pilots – their mid-air duels with the likes of the infamous ‘Red Baron’ – that were reported regularly in the newspapers as good morale stories. And it was never really mentioned that one of the main reasons that they were in the sky at all was to protect the aerial photographers: ensuring that the vital pictures they took made it safely back to base. These were sobering thoughts as I wrestled with the elements at the back of the Bristol. My pilot, Jean-Michel Munn, had to maintain a steady course to give me even the slimmest chance of spotting and photographing the hidden flags. After he’d taken us on several wide circuits of the aerodrome I had managed to negotiate the severe buffeting to take a series of shaky, blurred pictures of the hidden flags. But I was under no illusions. Had we been in the middle of a warzone, we would have been easy prey. As one Great War observer put it chillingly: ‘in the air, you could see death coming’. We’d probably only been flying for around half an hour when Jean-Michel brought us in low over a field of golden corn to touch back down on the grass landing strip. When the engine was finally turned off, the sudden silence – and stillness – was shocking. I removed my flying helmet and goggles. To say I looked windswept would be an understatement. After the war, demobbed pilots and photographers used the skills acquired above the trenches to set up the world’s first commercial aerial photography company – ‘Aerofilms’. 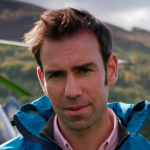 To find out more, watch Scotland from the Sky, broadcast on BBC1 Scotland at 9pm on 16, 23 and 30 May, and also available on BBC iPlayer (link to come). A book based on the series and published by HES is available now from our online shop and all good booksellers.